Acoustic guitar players seem to be in a never-ending pursuit of the "best" way to amplify their instrument. It doesn't take long to realize that the stock pickups for most instruments can fall quite short of picking up the "true" sound of a guitar. In the past year, I have taken my Taylor 310 and added both a K&K Pure pickup and a L.R. Baggs Lyric Microphone. I then made a comparison video that highlights the differences between these pickups. This is the pickup that came with my Taylor. Yes, this is guitar was made before Taylor's expression system came standard. Although I am fairly biased against piezo under-saddle pickups, I will say that I now use the Fishman almost as much as the other two pickups. Why? - Ease of use. The onboard preamp & EQ eliminate the need for outboard pre+eq. I typically use this as my second guitar that I lay flat & "tap" on while I use my no. 1 guitar for the heavy lifting. When I do play this guitar by itself, I like to add the Lyric to either the Fishman or the K&K. Other pros: Very feedback resistant. Clean, direct, & cutting tone. That being said, it does sound the least natural compared to the K&K pure & Baggs' Lyric. Piezo under-saddle pickups are often criticized for their "quack" or as I like to call it "fart" sound that often comes through. Ultimately, I find the under-saddle transducer by itself to be lacking. After having a wonderful experience with the K&K Trinity Onboard system on my other guitar, I was excited to hear the results on my Taylor. When I plugged into my Taylor's K&K pickup, the first impressions were less than great. I would describe the sound as muddy, with not very much hi mids or highs to be heard. However, when using an eq to remove a good amount of 200hz-400hz, and adding some hi-mids & highs, this thing begins to sound wonderful. This soundboard transducer comes in many varieties, some with preamps, volume control & eq. For my Taylor I installed the one with no preamp, eq, or control, which means that outboard preamp & eq is a must. In the video, I am going straight into my Saffire Pro 24 interface which has great preamps. I have heard from many guitarists using the pure that using the K&K preamp makes a world of difference. I am very happy with the results currently, so I have not purchased the K&K preamp. When it comes to sounding natural, my opinion is that the K&K pure does a wonderful job. It of course does not sound anywhere near as airy & natural as a microphone, but that is not the only important factor in an acoustic guitar's live sound. The Pure is a wonderful mix of direct punch & "natural" acoustic tone. First, the Lyric is not a pickup. The lyric is a microphone (+preamp), and the fact that a mic alone in an acoustic guitar can sound this full is amazing. If you are going for the most overall natural sounding acoustic guitar tone, this might be the ticket. I won't go into detail about the genius & common sense used in the development of this microphone. Instead i'll let it speak for itself. Let's talk about the sound: First of all, it's good. Very good. However, I personally don't feel that it's the end all of acoustic guitar amplification. On my guitar, it comes out with a fairly "boxy" sound, but like the K&K pure, can be made to shine wonderfully with some smart EQ work. However, for me the mic lacks in the realm of low end. Yes, one can use eq to boost the low frequencies, but there are limits to what I could get out of it. 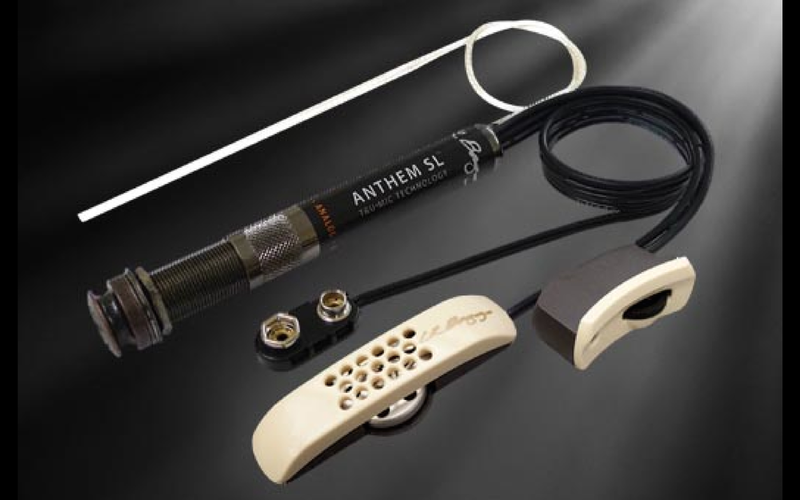 Other good things about the Lyric: Easiest to install, and fairly non-invasive or permanent. The K&K & the Lyric are both great ways to amplify a guitar. Using them together is even better because of their complementing strengths. If you don't want to bother with the headache with multiple systems, I would also recommend the L.R. Baggs Anthem. Although I do not have very much personal experience with the Anthem, the microphone is said to be nearly the same as the one found on the lyric. The difference being that it also has a under-saddle piezo transducer to handle the low end. This is a great blend in an easy package, I feel confident recommending it based on the use I have seen of it live, as well as my own experience with the similar Lyric system. Choose what sounds right to you. My personal favorite is the K&K (with the K&K trinity preamp in my Travis guitar), but I also love what L.R. Baggs has to offer. Really, it's hard to go wrong with these great options. Disclaimer: The links to these products are affiliate links. If you do make a purchase from one of these sites I will get a small commission. If you found this helpful, purchasing through one of these links is a great & very appreciated way to show it.